We often get asked about corrosion on the PCB of Philips Sonicare toothbrushes, including on the top-of-the-range DiamondClean toothbrush (HX9300 series), as well as the FlexCare, HealthyWhite, EasyClean and other Sonicare models. When the seal at the top of the toothbrush fails and the toothbrush is stored standing upright with the head still attached it means that water can seep past the seal, into the inside of the toothbrush handle and start to corrode the inner workings of your Sonicare. You can see around the two arrowed holes there is corrosion. These holes are “plated-through” meaning that the holes are coated with metal to allow them to conduct electrically from the track on this (lower) surface of the PCB to tracks on the upper surface. The corrosion shown above was enough to stop the electrical conduction ability of this track. 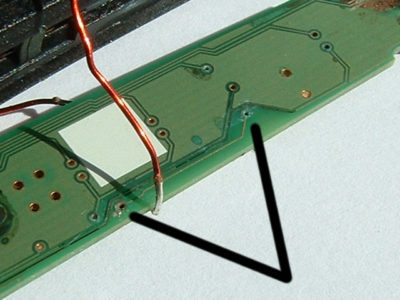 As it is a simple point-to-point track connecting at both ends to the other surface of the PCB continuity was checked between the two holes from the upper surface side and the track underneath was found to be non-conducting. The repair shown below was made using some insulated copper telephone wire, but this was probably slightly too thick. A finer enamelled magnet wire might have been a better choice, similar to that used to wind the coils of the solenoid. The hole arrowed on the right in the 1st photo emerges by the letter “n” of the white “Gnd” on the upper surface on the left in the 2nd photo. A track then connects that hole to a leg of the black IC and then to a test point (arrowed on the left) where the white wire is now soldered to. 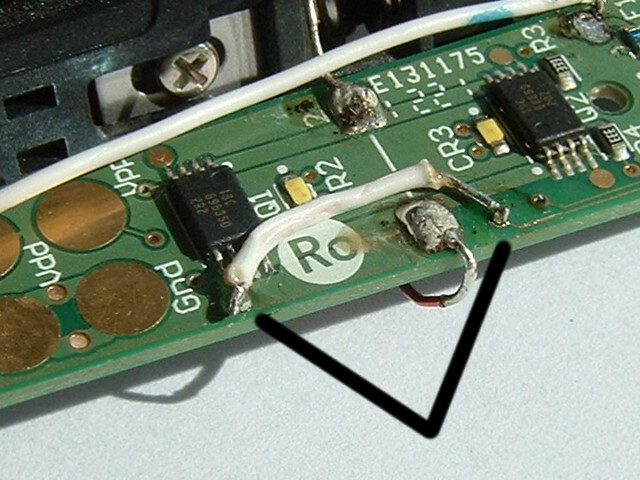 The hole arrowed on the left of the 1st photo connects through the PCB to where the right hand end of the white wire shown in the 2nd photo is soldered in place. On this particular toothbrush there was a second patch of severe corrosion on the underside of the PCB under the button. A second, longer, bypass wire was used to restore continuity for this fault. Part of that wire can be seen in the 2nd photo. The lesson that Philips could learn from all this, apart from making a better seal, is to use wider tracks on their PCBs and a thicker layer of copper so they’re more resistant to corrosion! To reduce the chances of water getting into your Sonicare toothbrush and causing corrosion please see our electric toothbrush care tips. Is there a way to open the Philips Sonicare toothbrush, repair the rust damage, and put the thing back together so it can continue to be used? Thanks. Yes there are opening guides for various Sonicare toothbrushes on our toothbrush battery guides page.